Put your fear of heights on hold and embrace a unique adventure 1,000 feet above Michigan Avenue. Soar to the 94th floor in super fast elevators of the Hancock Building Chicago for unforgettable views of the Windy City from the 360 Chicago Observation Deck. Feeling a little nervous? We get it - but you can grab some liquid courage or a coffee from the cafe before heading over to TILT where you can lean 30 degrees over the edge and see things from a very different angle. Bragging rights included at no additional charge! For a more refined experience and to celebrate special occasions, book a table at The Signature Room on the 95th floor and get even higher while you enjoy contemporary American cuisine or classic cocktails in the lounge. Check it! General admission - $20.00 for adults; $13.00 for youth 3-11 years of age. Children under 3 are free. All prices include tax. 9:00 a.m. to 11:00 p.m., 365 days a year. Last entry is at 10:30 p.m. daily. 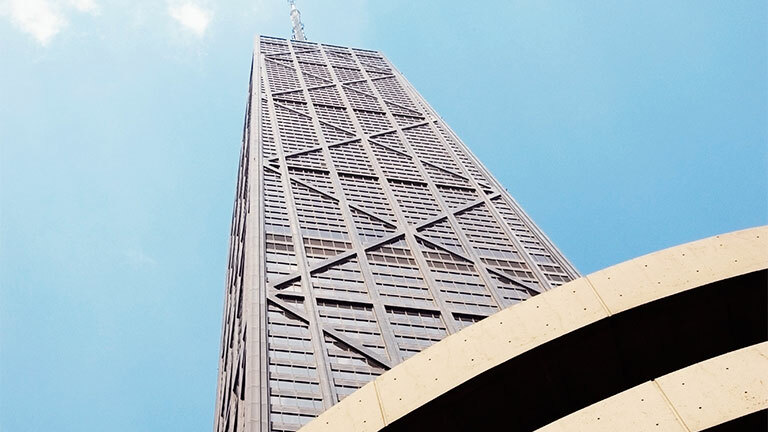 are there places to eat in the john hancock center? Don't fear if hunger strikes while your high in the sky. The Architect's Corner is a modern café and bar, located in the 360 CHICAGO observation deck. There you can find artisanal snacks, gelato, coffee and a full bar with daily cocktail specials, so you can watch the sunset in style. To celebrate special events, head up one floor to The Signature Room and Signature Lounge, where locals and visitors have gathered for decades to celebrate life's big and little moments with gourmet American cuisine and delicious cocktails. Reservations and proper attire required. are there things to do for kids at the john hancock center? If the amazing views aren't enough to entertain the younger crowd, they will also enjoy Sky School. Kids and adults can discover fun facts and trivia and participate in hands-on activities during their visit. Imaginations will soar with a diverse curriculum that covers history, architecture, social studies, science, math, art and geography. Contact groupsales@360chicago.com or call 312-751-3681 for more information. Why Stay at ACME Hotel Company?